ABSTRACT: Everhart, M. J. and J. Bussen. 2001. 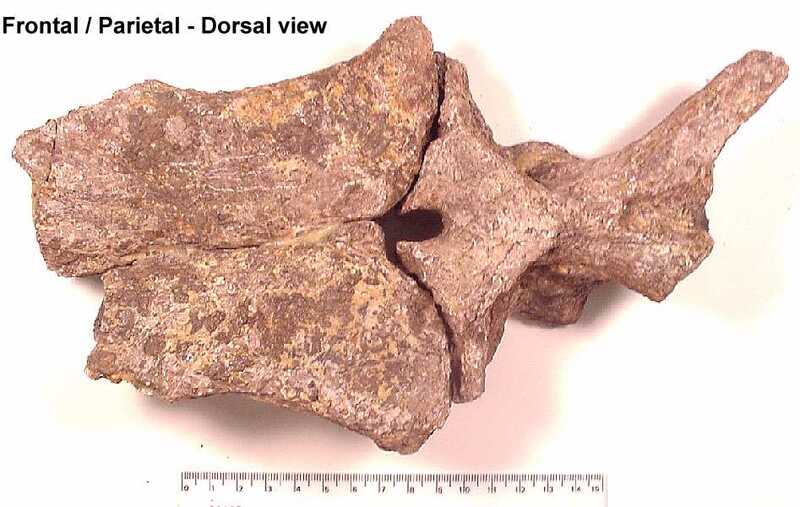 First report of the mosasaur, Plioplatecarpus cf. primaevus, from the Pierre Shale (Campanian) of western Kansas. Kansas Academy of Science, Transactions 20(Abstracts): 28-29. The genus Plioplatecarpus was created by Dollo in 1882 on the basis of relatively incomplete European specimens (Plioplatecarpus marshi). The first American material was probably that collected from the Navesink Formation of New Jersey and published by Cope in 1869 as Mosasaurus depressus. Plioplatecarpus primaevus was first collected in from the DeGrey Member (late Campanian) of the Pierre Shale near Pierre, in Hughes County, South Dakota in 1958 by D. R. Crandell (Russell, 1967). Holmes (1996) described the first relatively complete specimen of Plioplatecarpus primaevus from the Upper Cretaceous Bearpaw Formation of south central Saskatchewan in Canada. Burnham (1991) reported on a new species of Plioplatecarpus from the Upper Demopolis Chalk Formation of Sumter County, Alabama. 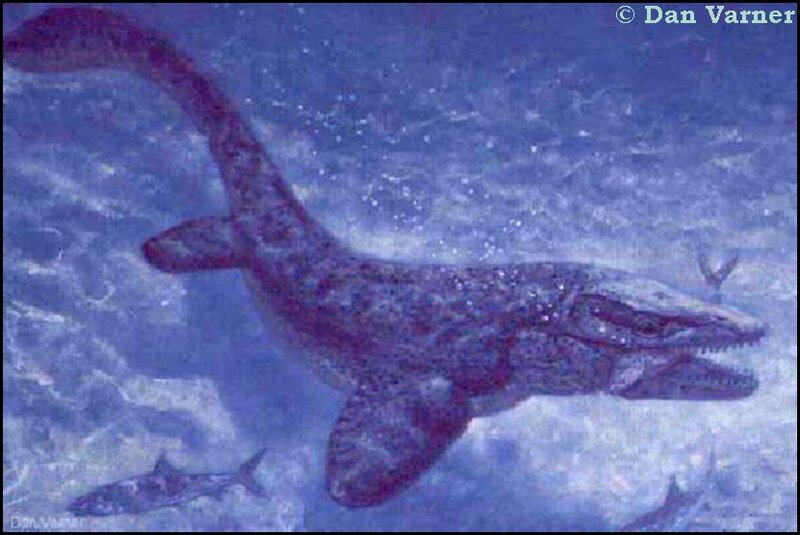 Plioplatecarpus is a comparatively late-comer as mosasaurs go, first appearing in the middle Campanian (Martin, et al, 1996) and probably surviving until the end of the Cretaceous. 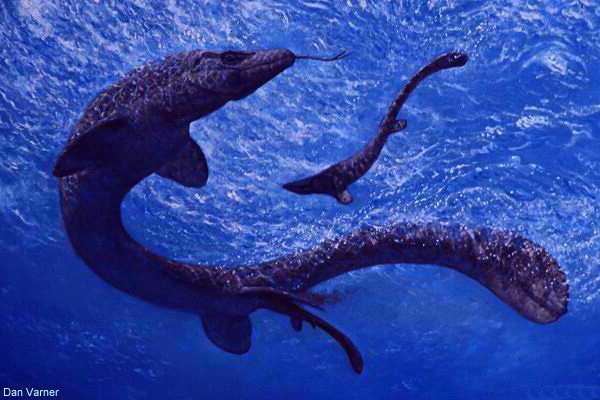 According to Russell (1967), Plioplatecarpus primaevus is very closely related to the earlier genus, Platecarpus, which appears to have become extinct by the early to middle Campanian (about 80 mya). Plioplatecarpus has been found in a number of places around the world (Mississippi-Alabama, South Dakota, North Dakota, Canada, Sweden, and the Netherlands). It is also the only mosasaur that has been found with fetal material. This is an important indication that mosasaurs gave live birth to their young. The skull of Plioplatecarpus is relatively short compared to most other mosasaurs and the eyes are proportionately larger. The number of teeth in the jaws is reduced (12 or less) and the teeth are usually strongly recurved. There is a reduced number of presacral vertebrae (29) and the scapula is larger than the coracoid. The remains were found in the upper portion of the middle (organic-rich shale) unit of the Sharon Springs Member in Logan County. This exposure is also considered to be early Middle Campanian in age and contains both Baculites mclearni and B. asperformis. As an inhabitant of the Western Interior Sea, it should also have been found the the Pierre Shale of western Kansas but had not been documented from that area until now. The general poor quality of fossils from the Sharon Springs Member of the Pierre Shale in Kansas due to selenite intrusion has generally discouraged serious collecting in this part of Kansas. 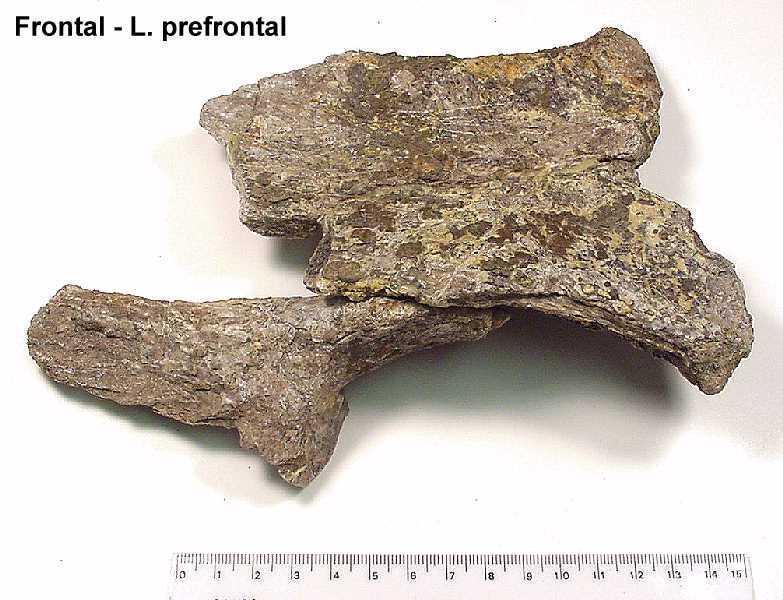 However, some very special fossils, including the type specimen of Elasmosaurus platyurus Cope and other plesiosaurs, the only specimen of Globidens from Kansas and the Plioplatecarpus remains shown below suggest that this area is a rich resource of late Cretaceous marine material. You can go to Ben Creisler's Mosasaur Pronunciation and Translation Guide to learn more about the name Plioplatecarpus (and all the other mosasaurs). 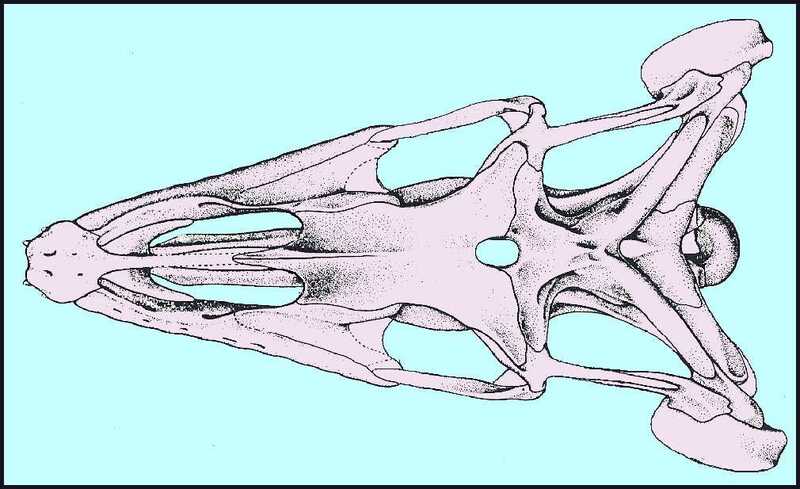 Based on the features of this skull and the other specimens of Plioplatecarpus that have been found in the Western Interior Sea, it is most likely that these remains will eventually be identified as Plioplatecarpus primaevus. It also appears that this is probably one of the earliest reports of Plioplatecarpus from any where. Epilog: In February, 2005, I discovered that there may have been an earlier specimen of Plioplatecarpus found as early as 1870 by B. F. Mudge. While it was initially identified as "Liodon" by Cope and then placed in Platecarpus (Cope, 1875), it was re-identified by Russell (1967) as Prognathodon. Other workers (Lingham-Soliar, 1989) and Bell (1973) consider the remains to be that of Plioplatecarpus. Read the full story here. A close up of the anterior end of the left side of the muzzle, showing the suture between the premaxilla and the left maxilla. 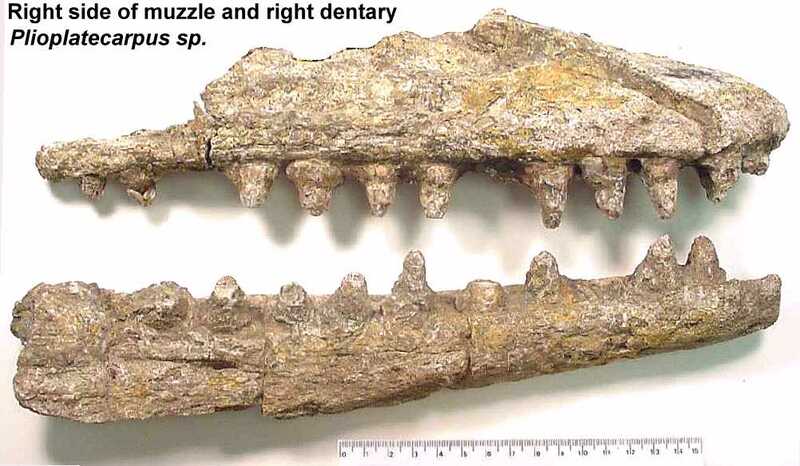 A view of the right side of the muzzle, showing the suture between the premaxilla and the right maxilla. Both maxillae are complete and show a total of eleven teeth in each. There are four teeth in the premaxilla. 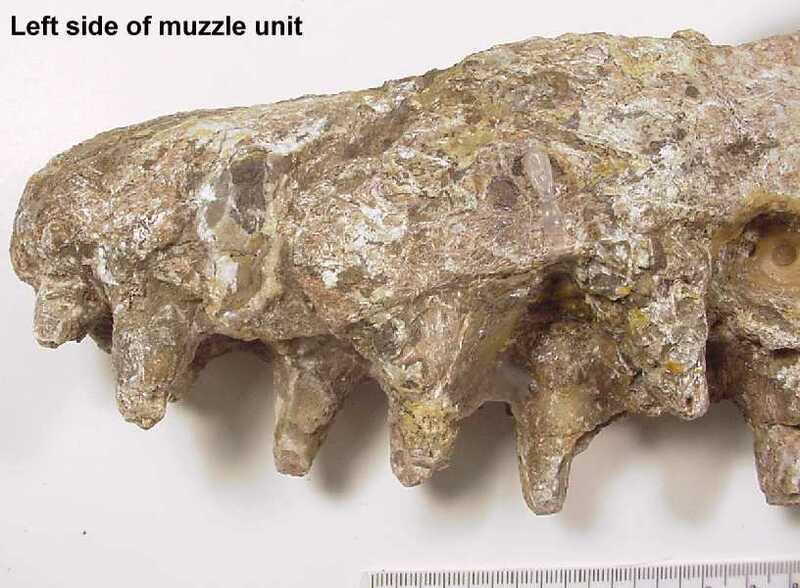 A view of the right side of the muzzle and lower jaw, modified to remove the posterior portion of the left maxilla shown in the above picture. A medial view of the right dentary. There are twelve teeth in the dentary. A view of the right dentary from above. 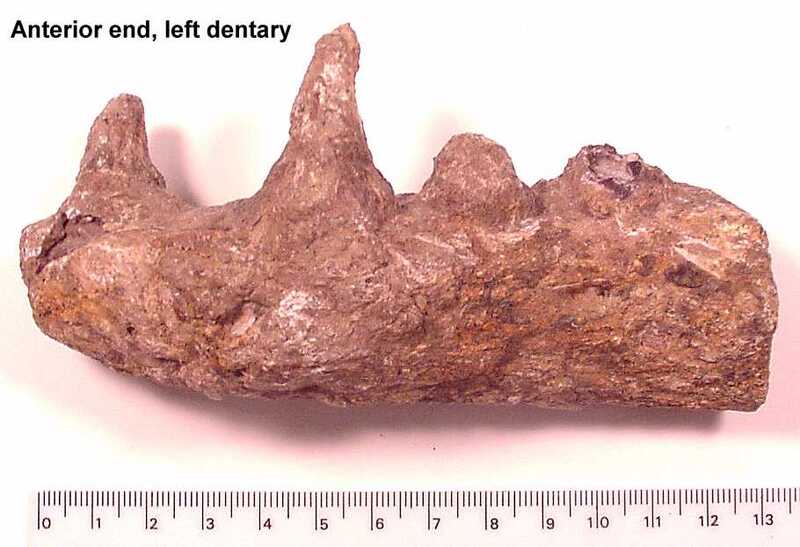 A view of the right dentary. The anterior end of the left dentary. The bone was deformed when it was preserved on top of a rib. A dorsal view of the frontal and parietal. Note that the parietal foramen is not as large as shown in the drawing above. This may be an artifact caused by the invasion of selenite crystals into the bone. The left prefrontal and frontal showing the location of the large opening for the left eye. 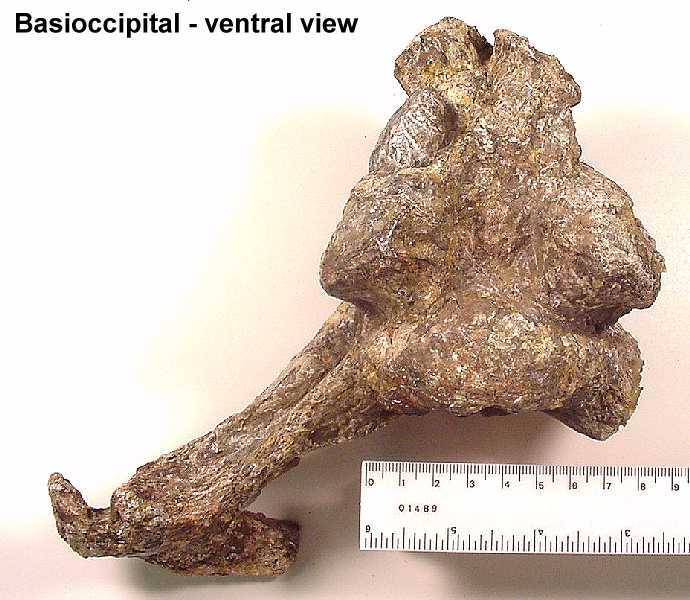 An anterior view of the braincase, including the basioccipital. The two 'wing-like' structures are the exoccipitals They merge with the squamosal and the parietal to form the suspensorium for the quadrate at the back of the head. 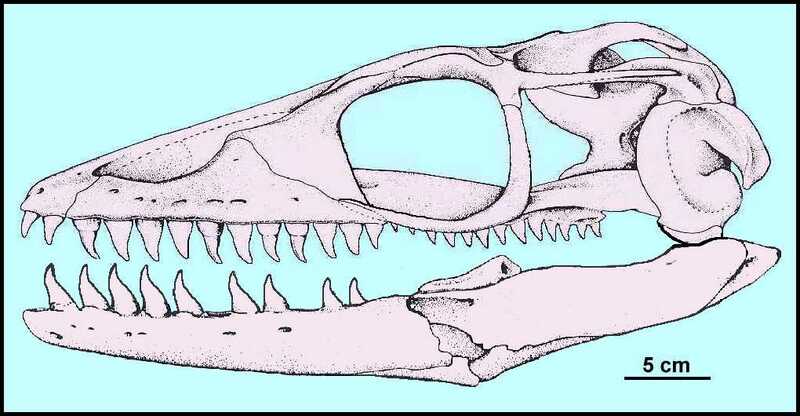 The brain of Plioplatecarpus was proportionally larger than that of most other mosasaurs, following the trend found in some dinosaur lineages and in modern vs. primitive birds. 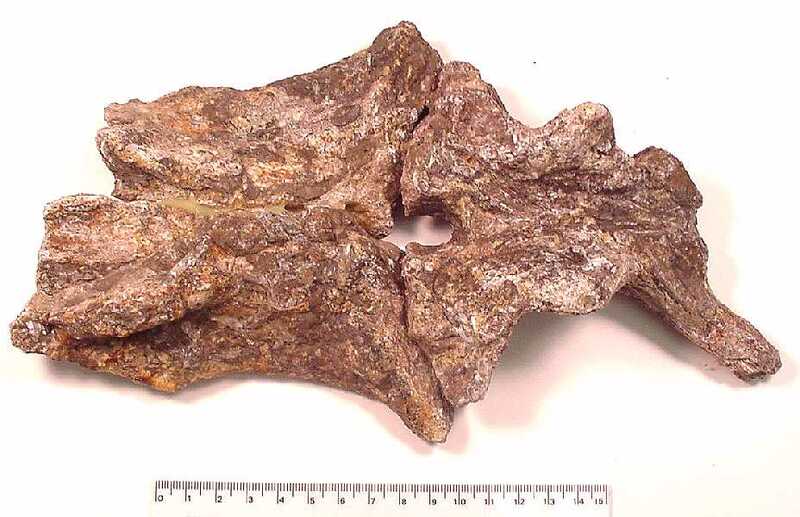 A posterior view of the braincase showing the occipital condyle and the opening for the spinal cord. 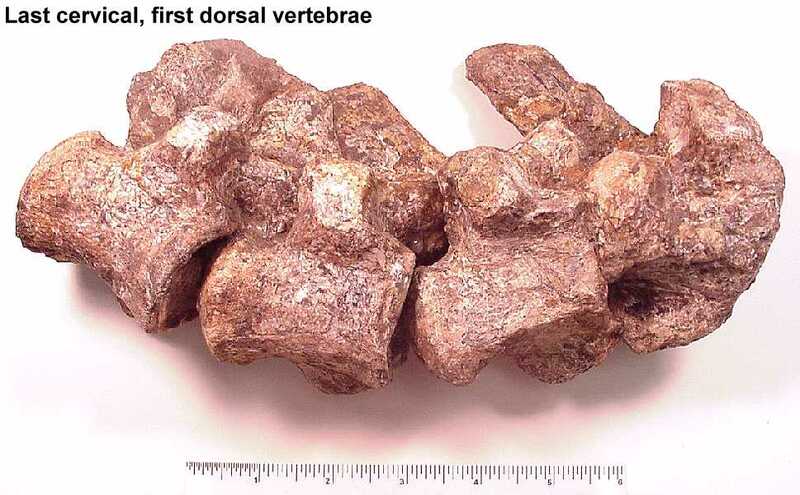 The braincase in mosasaurs is formed primarily from the basioccipital on the bottom and the paired opisthotics on either side. 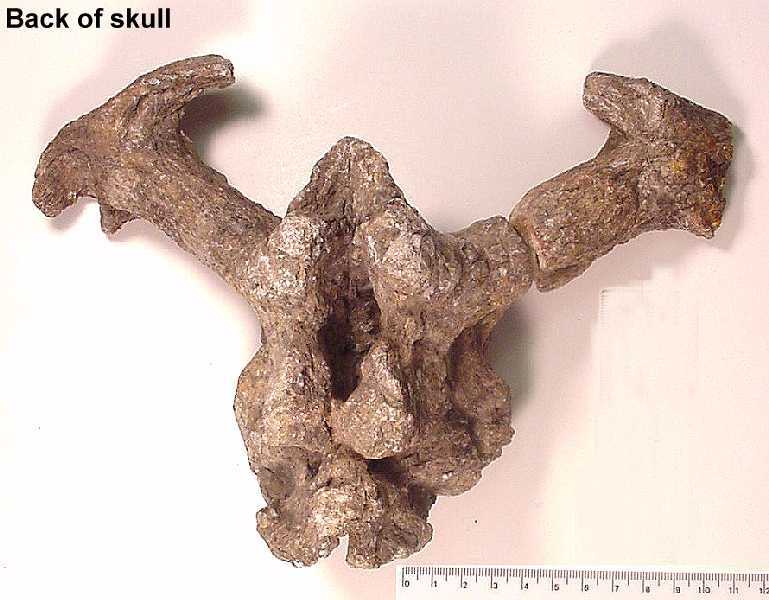 The 'wings' that extend from the braincase (only one shown in this picture) are the paroccipital processes of the opisthotic bones. They connect the braincase with the squamosal and parietal bones at the back corners of the skull and provide the connection for the quadrate bones (suspensorium). A ventral view of the basioccipital, including the right opisthotic/paroccipital process. 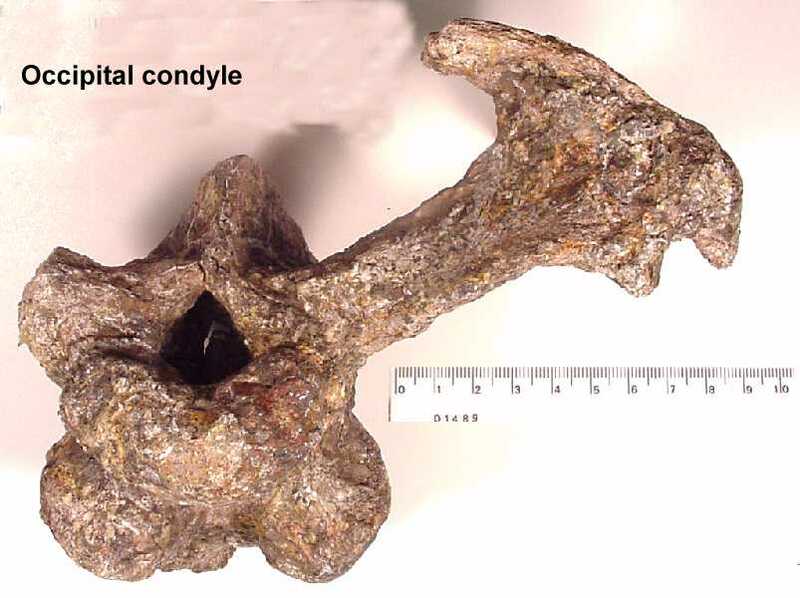 An articulated series of dorsal vertebrae, including the last cervical vertebra (right). 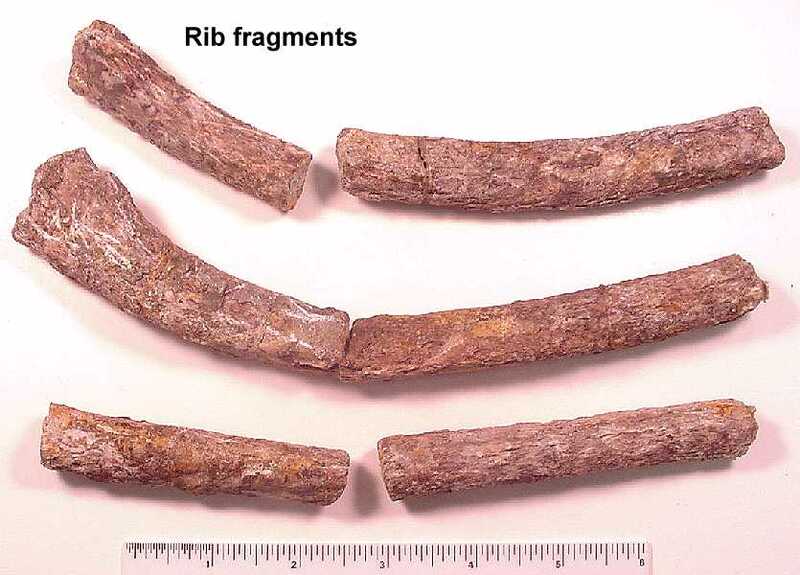 Several rib fragments found with the remains. Plioplatecarpus ribs characteristically are round in shape, in contrast with the flattened appearance of most mosasaur ribs. Bardet, N., J. W. M. Jagt, M. M. M. Kuypers, and R. W. Dortangs. 1998. Shark tooth marks on a vertebra of the mosasaur Plioplatecarpus marshi from the Late Maastrichtian of Belgium. Publicaties van het Natuurhistorisch Genootschap in Limburg 41(1): 52-55. Bell, G. L. Jr. 1997. A phylogenetic revision of North American and Adriatic Mosasauroidea. pp. 293-332 In Callaway J. M. and E. L Nicholls, (eds. ), Ancient Marine Reptiles, Academic Press. Burnham, D. A. 1991. A new mosasaur from the Upper Demopolis Formation of Sumter County, Alabama, Masters Thesis, University of New Orleans, 63 pages. Burnham, D. A. 1992. A new species of Plioplatecarpus (Squamata, Mosasauridae) from the Sharon Springs Member of the Pierre Shale Formation (Campanian) of Wyoming. Jour. Vert. Paleon. 12(suppl. to 3):20A. Crandell, D. R. 1958. Geology of the Pierre area, South Dakota. U. S. Geol. Surv. Prof. Paper 307, 83pp. Everhart, M. J. and J. Bussen. 2001. First report of the mosasaur, Plioplatecarpus cf. primaevus, from the Pierre Shale (Campanian) of western Kansas. Kansas Acad. Sci. Trans. 20(Abstracts):28-29. Holmes, R. B. 1996. Plioplatecarpus primaevus (Mosasauridae) from the Bearpaw Formation (Campanian, Upper Cretaceous) of the North American Western Interior Seaway, Jour. Vert. Paleon., 16(4):673-687. Landes, R. W. 1940. Paleontology of the marine formations of the Montana Group, Pt. 2, of Geology of the southern Alberta plains: Geological Survey of Canada, Memoir 221, p. 129-217. Lingham-Soliar, T. 1992. A new mode of locomotion in mosasaurs: Subaqueous flying in Plioplatecarpus marshii, Jour. Vert. Paleon., 12(4):405-421. Lingham-Soliar, T. 1994. The mosasaur Plioplatecarpus (Reptilia, Mosasauridae) from Upper Cretaceous of Europe, Bulletin de L'Institut Royal des Sciences Naturelles de Belgique, Sciences de la Terre, 64:177-221. Martin, J. E., G. L. Bell, and J. L. Bertog. 1996. Distribution of mosasaurs of the epicontinental seaway. GSA RM Sect. Ann. Meeting, Abstracts with Programs, 28(4):16. Sheldon, M. A., G. L Bell, Jr., and J. P. Lamb. 1996. Histological characters in prenatal specimens of the mosasaur, Plioplatecarpus primaevus. Jour. of Vert. Paleon. 16(suppl. to 3):64A.